Regal Lager Inc. is recalling about 1,200 CYBEX strollers sold in the United States and Canada. The strollers hinge mechanism poses a fingertip amputation and laceration hazard to the child when the consumer is unfolding/opening the stroller. The firm has received one report of a child placing his finger in the strollers hinge mechanism, resulting in a finger fracture. This recall involves Ruby, Onyx and Topaz models of CYBEX umbrella strollers. CYBEX is printed on the side of the strollers. The strollers were sold at department and juvenile product stores nationwide between August 2009 and November 2009 for between $140 and $260. They were made in China. Consumers should immediately stop using the recalled strollers and contact Regal Lager to receive a free hinge cover retrofit kit. For additional information, contact the Company Service Center at (800) 593-5522 between 8:30 a.m. and 5:30 p.m. ET Monday through Friday or visit the firms Web site at www.regallager.com/recalls. Liebherr is recalling about 2,700 Liebherr built-in 24-inch-wide single door refrigerators. The refrigerators door can detach, posing an injury hazard to consumers. Liebherr has received 13 reports of doors detaching, including two reports of injuries involving bruising and strains. This recall involves Liebherr built-in 24-inch wide single door refrigerators with model numbers R1400, RI1400, RB1400, and RBI1400 sold individually or as a component of side-by-side refrigerators. The refrigerators come in stainless steel and various custom finishes and are built into the kitchen cabinetry. Liebherr is written on the top interior control panel. The model number can be found on a label located behind the bottom drawer on the left interior side of the single door refrigerator. The side-by-side refrigerators were marketed as model numbers SBS240, SBS24 I0, SBS245, SBS24I5. This model number is not found on the product. The refrigerators, made in Germany, were sold by appliance and specialty retailers nationwide from January 2005 through November 2009 for between $2,500 and $3,200. Consumers with recalled refrigerators should contact Liebherr immediately to schedule a free in-home repair. Consumers should check their refrigerator immediately to see whether the door hinge pin has become loose (see below). If the hinge has not become loose and the door is functioning properly, consumers may continue to use the refrigerator until it is repaired. For additional information, contact Liebherr toll-free at (877) 337-2653 Monday through Friday 8 a.m. to 5 p.m. MT or visit Liebherrs Web site at www.liebherr-appliances.com. Macy's is recalling about 9,600 three-piece boys Santa suits. Loose buttons on the suits jacket may easily detach, posing a choking hazard to young children. This recall includes First Impressions boys three-piece Santa Sets in sizes 0-24 months, including a jacket, pants and hat. For units sold at Macys and on macys.com the UPCs are: 0689439416622, 0689439417131, 0689439417148, 0689439417155, 0689439417162, and 0689439417179. For units sold at the Navy Exchange stores the UPCs are: 0706254537346, 0706254537353, 0706254537360, 0706254537377, 0706254537384, and 0706254537391. For all products the tracking label information sewn into the side seam of the top and bottom includes: Style 9131, Supplier 22155, Mfg 34837, Aug. 2009, Macys Inc. The Santa suits, made in China, were sold at Macys and macys.com, including locations in Puerto Rico, from September to December 2009, and at U.S. Navy Exchange stores from November through December 2009 for about $20 to $40. Consumers should immediately remove the buttons from the jacket to eliminate the hazard or return the garment to any Macys or U.S. Navy Exchange store for a full refund. For additional information, contact Macys toll-free at (888) 257-5949 between 10 a.m. and 10 p.m. Monday through Friday or visit Macys Web site at www.macys.com. Blip Toys is recalling about 15,000 Nature Wonders HD pinto horse toys. The surface paint coating on the horse contains excessive levels of lead, violating the federal lead paint standard. This recall involves the Nature Wonders HD pinto horse toy figures with model number 92093. The plastic horse is white with brown spots and measures about 4 inches tall. The model number and Nature Wonders HD are printed on the retail tag wrapped around the horses leg. The toys were sold at Walmart stores nationwide from January 2009 through July 2009 for about $4. They were made in China. Consumers should immediately take the recalled toys away from children and contact Blip Toys to receive a free replacement toy. For additional information, please contact Blip Toys toll-free at (888) 405-7696 between 8 a.m. and 5 p.m. CT Monday through Friday, or visit the firms Web site at www.bliptoys.com/recall. RadioShack is recalling about 6,000 Knight Hawk toy helicopters. The battery housing under the helicopter canopy can overheat while charging, posing a fire hazard. The firm has received one report of a fire that started while a store demo toy was charging. No injuries or property damage have been reported. This recall involves Danbar Toys Knight Hawk 3D remote control helicopters. The helicopter can be identified by model number 006047 marked on the back of the controller and the Knight Hawk 3D logo on the front of the controller. The product was sold at RadioShack as catalog number 600-0566 (60-566) for ages 8 and up. The helicopters were sold at RadioShack stores, RadioShack dealer franchise stores nationwide and at www.radioshack.com from October 2009 through November 2009 for about $60. They were made in China. Consumers should immediately take the helicopters away from children and return the toy to the nearest RadioShack store for a full refund. Johnson Health Tech North America is recalling about 18,000 Horizon Fitness and LIVESTRONG Fitness elliptical trainers. The foot pedal can become disengaged, posing a fall hazard. The firm is aware of 58 reports of foot pedal disengagements. No injuries have been reported. The recalled products are elliptical trainers branded under the Horizon Fitness and LIVESTRONG Fitness names. The brand name is located at the top of the console display with the model numbers just below and the serial numbers are located on the front support tube of the trainer. The recalled models and serial numbers are listed below. The trainers were sold at sporting goods stores nationwide and online at www.livestrongfitness.com and www.dickssportinggoods.com between October 2009 and November 2009. They were made in China. Consumers should stop using the elliptical machines immediately and contact Johnson Health Tech NA to schedule a free in-home replacement of the defective pedals. Conair Corp. is recalling about 162,000 Lysol steam-cleaning mops. Hot water mixed with Lysol can forcefully spurt out and rupture the housing unit, posing a burn hazard and a laceration hazard to consumers from the broken housing unit. Conair has received 14 reports of hot water forcefully spilling out of the water reservoir compartment including two minor burn injuries to consumers who sought medical attention. This recall involves the Lysol Steam Cleaning Mop by Conair with model numbers SM10L or SM10LR. The model number is printed on the bottom of the mop under the microfiber cloth. The mops were sold at department, drug, hardware and home improvement stores and mass merchandisers nationwide and on the Internet from September 2006 through September 2009 for about $40. They were made in China. Consumers should immediately stop using the recalled mop and contact Conair to receive a free replacement steam cleaning mop. For additional information, contact Conair at (800) 687-6916 between 8:30 a.m. and 4:30 p.m. ET Monday through Friday, or visit the firms Web site at www.conair.com/recallmop. BSH Home Appliances Corp. is recalling 37,000 Thermador built-in ovens because they can pose a fire hazard. An additional 42,000 ovens were recalled in June 2007. The ovens can have gaps in the insulation where overheating can occur and when used in the self-cleaning mode it can cause nearby cabinets to catch fire. This poses a fire hazard to consumers. BSH Home Appliances has received three additional reports of incidents, including two that resulted in fires that damaged surrounding cabinets. No injuries have been reported. The recall involves Thermador Brand built-in double ovens with model numbers C272B, C302B, SEC272, SEC302, SECD272 and SECD302 and serial numbers between FD8403 through FD8701. Model and serial numbers are located on the underside of the control panel. The ovens, made in the U.S., were sold at appliance and specialty stores nationwide from June 2004 through July 2007 for between $3,000 and $4,400. Consumers should immediately stop using the ovens self-cleaning mode and contact the firm to schedule an inspection and free repair, if necessary. For additional information, contact Thermador at (800) 701-5230 24 hours/day, 7 days/week, or visit the firms Web site at www.thermador.com. 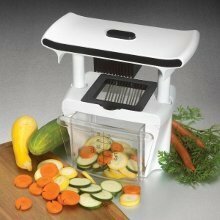 Lifetime Brands Inc. is recalling about 6,000 Pedrini Pro Chop vegetable choppers. Pieces of the choppers metal blades can break off during use and fall into food being prepared in the chopper, posing a laceration hazard to consumers. Lifetime Brands has received three reports of blades breaking off during use, including one report of minor cuts to a consumers mouth when a small piece of blade became lodged in food that had been sliced by the chopper. The recalled product is the Pedrini Pro Chop Professional Multipurpose Chopper with model number 5061050 and UPC 024131114849. The product is a multipurpose chopper and corer for fruits and vegetables. The model number and UPC are located on the choppers packaging. The choppers, made in China, were sold at Sams Club locations nationwide from October 2009 through December 2009 for about $25. Consumers should immediately stop using the chopper and return it to any Sams Club for a full refund. Sams Club is directly contacting consumers who purchased the recalled choppers. For additional information, contact Lifetime Brands Inc. at (800) 471-3986 between 8 a.m. and 5 p.m. ET Monday through Friday, visit the firms Web site www.lifetimebrands.com. Master Cutlery is recalling about 300 Eagle 5 Rifle Crossbows. The trigger mechanism becomes loose after 30 shots. When the safety mechanism is moved to the fire position, the crossbow will automatically discharge on its own. The recalled crossbow is black fiberglass and metal and has a 120 lb draw. Cross Bow and Eagle 5 are printed on the crossbow. The crossbows were sold on the Web at www.fingerhut.com from September 2009 through December 2009 for about $100. They were made in Taiwan. Consumers should immediately stop using the recalled crossbows and contact Master Cutlery for a free replacement trigger installation. Consumers who purchased the recalled crossbow are being contacted directly. For more information, contact Master Cutlery toll-free at (888) 271-7229 x138 between 9:30 a.m. and 6:30 p.m. ET Monday through Friday, visit the firms Web site at www.mastercutlery.com. MooreCo Inc. is recalling about 700 Spine Align and Posture Perfect Ergonomic office chairs. The legs of the chair can break, posing fall a hazard to the user. The company has received five reports of the legs of the chairs breaking, resulting in three minor injuries and in the aggravation of an existing back injury. This recall involves the Spine Align and the Posture Perfect Ergonomic Office Chairs with model numbers 34571 and 34556 respectively. The base of the chair is made of hard plastic and the chair has no marks or labels. Chairs bearing marks or labels are not included in this recall. The model number is found in the packaging. The chairs were sold through catalogs and online by United Stationers, Staples, S.P. Richards, and W.B. Mason from December 2007 through October 2009 for between $320 and $650. They were made in South Korea. Consumers should stop using the recalled chairs immediately and contact MooreCo for a free repair or a replacement chair. For additional information, contact MooreCo toll free at (888) 446-5161 between 8 a.m. and 5 p.m. Monday through Friday, or visit the companys Web site at www.chairrecall.com. Chrysler is recalling the 2010 model Chrysler Sebring, Dodge Avenger and Nitro; Jeep Liberty, Commander and Grand Cherokee; and 2009-2010 Dodge Ram truck. About 24,000 vehicles are involved. These vehicles may have been built with an improperly formed or missing brake booster input rod retaining clip, which could result in brake failure without warning. Chrysler will replace the brake booster input rod retaining clip free of charge when the recall begins in January. Dorel Juvenile Group is recalling more than 54,000 Cosco child restraint harnesses because they fail to conform to federal safety standards. The UV stabilizer used in the webbing may not adequately protect it from deterioration by ultraviolet rays, federal highway safety officials said. Dorel had argued that the risk of injury to infants was inconsequential but the National Highway Traffic Safety Administration (NHTSA) denied the company's petition. Dorel will notify registered owners and provide free webbing replacement kits for the harnesses when the recall begins in February 2010. Dorel has also agreed to recall certain child restraint systems manufactured in 2000 and 2001 because the tether webbing fails to conform to abrasion requirements. Owners may call Dorel at 1-866-690-2539. American Honda is recalling about 640 Acura MDX models. A bolt used to attach an interior trim piece to the A-pillar may not have been installed properly. In the event of a crash resulting in side curtain air bag deployment, the trim piece might not remain properly secured to the A-pillar, increasing the risk of injury to the driver or passenger. Dealers will inspects the interior trim piece and, if the bolt is missing, will install it free of charge. Caramia Furniture is recalling about 1,000 "Diane" drop-side cribs. The slats on the cribs drop-side can detach from the top and bottom rails, posing fall and entrapment hazards to the child. The firm has received 18 reports of slats detaching from the rails of the crib. No injuries have been reported. The cribs were manufactured between September 2002 and June 2004. A label affixed to the inside of the headboard or footboard lists the manufacturing dates. The cribs were sold at Buy Buy Baby and juvenile product and mass merchandise stores nationwide from September 2002 through December 2005 for between $240 and $370. They were made in Slovenia. Consumers should immediately stop using the recalled Diane crib and contact Caramia Furniture to receive a free replacement drop side. The free replacement will be available beginning March 2010. For additional information, contact Caramia at (877) 728-0342 between 8 a.m. and 5 p.m. ET Monday through Friday, or visit the firms Web site at www.caramiafurniture.com. Pier 1 Imports is recalling about 67,000 Santa Tea Light Holders. The flame from tea lights can ignite these tea light holders, posing a fire hazard. The firm has received three reports of the tea light holders burning. No injuries have been reported. The Ceramic Santa Tea Light Holder is red and white and designed in the image of Santa Claus. The tea light holder measures approximately 7-1/2 inches tall and 3-1/2 inches wide with a red metal hat and an opening in the back to place a tea light candle. SKU number 2417274 is printed on the bottom of the tea light holder. The holders, made in China, were sold at Pier 1 Imports in the U.S. and Canada from September 2009 through December 2009 for about $10. Consumers should stop using the Ceramic Santa Tea Light Holder immediately and return it to their nearest Pier 1 Imports retail store for a full refund or merchandise credit. For additional information, contact Pier 1 Imports at (800) 245-4595 between 8 a.m. and 7 p.m. CST Monday through Friday or visit the firms Web site at www.pier1.com. Pier 1 Imports is recalling about 40,000 Silver Glitter and Gold Glitter tea lights. The flame from the tea lights can ignite the glitter on the candle, posing a fire hazard. The firm has received three reports of the glitter burning. No injuries have been reported. This recall involves two styles of tea lights. A clear box of 24 silver glitter tea lights with SKU 2410335 and a clear box of 24 gold glitter tea lights with SKU 2410322. The SKU number is located on the bottom of the packaging. The tea lights were sold at Pier 1 Imports in the U.S. and Canada from September 2009 through December 2009 for about $10. They were made in Vietnam. Consumers should immediately stop using the tea lights and return them to their nearest Pier 1 Imports retail store for a full refund or merchandise credit. Mattress World is recalling about 750 mattress sets, because they fail to meet the mandatory federal open flame standard and pose a fire hazard to consumers. The recall involves Mattress World renovated twin, full, queen and king mattress sets sold in blue floral, white floral and taupe floral. Only those with the following information on tags attached to the mattress and foundation (box spring) are included in this recall. The mattresses were sold at furniture stores in Arkansas, Louisiana, Oklahoma and Texas from May 2009 through September 2009 for between $35 and $105. They were made in the United States. Consumers should immediately contact Mattress World to receive a full refund. Rockler Companies Inc. is recalling about 2,200 LED light kits. Defective wiring can cause the battery pack to overheat and explode, posing a risk of burn and fire hazards to consumers. This recall involves Rockler LED lights with either an interchangeable spotlight head or a magnifying head. Models included in the recall have stock numbers 26429 (spotlight or 27017 (magnifying). Stock numbers are printed on the lights packaging. The kits were sold at Rockler Woodworking and Hardware and other specialty stores nationwide from March 2009 through October 2009 for about $60. They were made in China. Consumers should immediately stop using the recalled LED light kits and call Rockler Companies to receive a free repair kit and installation instructions. Seattle Bike Supply is recalling about 350 2010 2010 Redline Conquest Pro Bicycles and Framesets. The bicycles fork legs can separate from the fork crown and cause the rider to lose control, posing a risk of serious injury if the rider falls. The firm is aware of three reports of forks separating with minor injuries reported in one of the incidents. The bicycles were sold at specialty stores nationwide between August 2009 and November 2009 for about $1,900 for the bicycle and about $550 for the frameset. They were made in Taiwan. Consumers should immediately stop using the recalled bicycles and framesets and contact their local Redline bicycle dealer to receive a free inspection and fork replacement. For additional information contact Redline Bicycles at (800) 283-2453 or visit the firms Web site at www.Redlinebicycles.com. St. Martin's Press is recalling more than 200,000 copies of Big Rex and Friends. A red plastic dot sewn into the book contains high levels of lead. This recall involves Big Rex and Friends cloth books. The book has a black and white striped border with a red dinosaur on the cover. The words Big Rex and Friends are printed on the cover. ISBN 031249260X or 9780312492601 is printed on the back of the book. The books, made in China, were sold at Barnes & Noble, Toys R Us, Amazon, Borders and other bookstores and retailers nationwide from May 2004 through October 2009 for about $9. Consumers should immediately take the recalled book away from children and contact St. Martins Press for instructions on returning the book for a full refund. For additional information, contact St. Martins Press at (800) 347-9411 or visit the firms Web site at www.priddybooks.com/recall. Oxmoor House, Inc., is recalling nearly 1 million home improvement books because they contain faulty wiring instructions, posing shock and fire hazards to consumers. The books were sold by home improvement stores and bookstores nationwide from January 1975 through December 2009 for between $13 and $35. They were printed in the United States. Consumers should immediately stop using these books and contact Oxmoor House for a full refund. For additional information, contact Oxmoor House toll-free at (866) 696-7602 anytime, or visit the firms Web site at www.sunsetrecall.com. OnLine Packaging Inc. is recalling about 75 bottles of Food Club Supreme Clean Clear Ammonia. The bottle, which is labeled as containing ammonia, actually contains household bleach. The mislabeling of the bottles can pose a chemical hazard to consumers. If bleach is accidentally mixed with ammonia or acid, irritating or toxic gases could be produced. This recall involves Food Club Supreme Clean Clear Ammonia that is packaged in a 64 ounce white bottle with the date code 232 stenciled on the lower shoulder of the bottle. The ammonia was sold at Piggly Wiggly Midwest stores from August 2009 through September 2009 for about $1.50. Consumers should immediately return the product to Piggly Wiggly for a full refund or dispose of the bleach in accordance with state and local requirements. For additional information, contact OnLine Packaging at (800) 398-8177 between 9 a.m. and 4 p.m. CT.
No-Spill LLC is recalling about 7,500 5-gallon gasoline cans. The gas containers can leak fuel at the black plastic collar where the spout connects to the can, posing fire and burn hazards to consumers. The 5-gallon gas cans are made from heavy-duty red plastic and carry date codes AIP09202 through AIP09222. The date code is located on the bottom of the can. Not all cans in this date range are affected. The contains were sold at lawn & garden stores nationwide, hardware retailers and online from August 2009 through November 2009 for about $30. Consumers should test their gas cans to determine whether they leak and immediately stop using the leaky cans. Consumers should contact No-Spill to receive a free replacement. For additional information, contact No-Spill toll-free at (877) 928-0049 between 8:30 a.m. and 4:30 p.m. CT Monday through Friday or visit the firms Web site at www.nospill.com/recall. Primal Vantage is recalling about 16,000 plastic tree steps. The plastic portion of the step can break, posing a fall hazard to hunters and other sportsmen. Primal Vantage has received five complaints of step breakage, including two reports of consumers being bruised and cut. The product is a plastic tree step that attaches to a tree via a nylon strap and a large metal buckle. It is used to climb a tree in order to hunt from an elevated position. Models 105 and 155 both have a 12/08 date code, which is stamped on the plastic portion of the step. The product was sold in 2009 at various outdoor and sporting goods retailers nationwide as a 3-step package in model 105 or as a single step in model 155. It was made in China. Consumers should stop using the tree steps immediately. They should contact Primal Vantage for details on how to obtain a full refund. Consumers are asked not to return the product to retail stores as refunds can only be provided by Primal Vantage. For additional information, contact Primal Vantage toll free at (866) 972-6168 between 9:30 a.m. and 4:30 p.m. ET Monday through Friday or visit their website at www.treestandcustomerservice.com to print a return form or for further information on how to locate the date code on your tree step. Acer is recalling about 22,000 Aspire series notebook computers. An internal microphone wire under the palm rest can short-circuit and overheat. This poses a potential burn hazard to consumers. Acer has received three reports of computers short-circuiting, resulting in slight melting of the external casing. No incidents occurred in the United States. No injuries have been reported. The recalled notebook computer models are the Acer AS3410, AS3410T, AS3810T, AS3810TG, AS3810TZ and AS3810TZG. The computers screen size is about 13.3 inches measured diagonally. Not all units are affected. Consumers should contact Acer to determine if their unit is included in the recall. The computers were sold by ABS Computer Technologies, D&H; Distributing, Frys Electronics, Ingram Micro, Radio Shack, SED/American Express, Synnex Corporation, SYX Distribution, Tech Data Corporation and other retailers nationwide and Amazon.com from June 2009 through October 2009 for between $650 and $1,150. They were made in China. Consumers should stop using the recalled notebook computers immediately and contact Acer to determine if their notebook is affected and to receive a free repair. For additional information, contact Acer toll-free at (866) 695-2237 anytime, or visit the firms Web site at www.acer.com. Jide Trading is recalling about 2,100 toy military figures sold at Dollar Stores and other discount stores. The toys' surface paint contains excessive levels of lead. The mini military toy set is packaged on a blister card and includes a male military figure about four inches in height with various accessories. Consumers should immediately take the recalled toys away from children and contact Jide Trading for a full refund or replacement toy. For additional information, call Jide Trading toll free at (866) 544-7822 between 8 a.m. and 6 p.m. ET Monday through Friday, or visit the firms Web site at www.jidetrading.com.